Supports the nervous system, helps reduce stress and tension and promote the body’s natural balance. Iupports the nervous system, helps reduce stress and tension and promote the body’s natural balance. 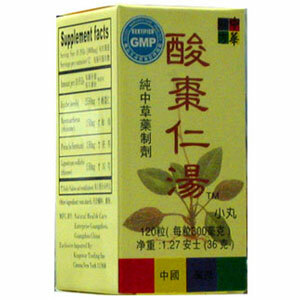 Nourishes heart blood, clears deficiency heat, protects the heart, invigorates blood, calms shen. Use for disturbed shen causing insomnia, restlessness, palpitation, night sweats, anxiety, or vivid uncomfortable dreaming. Also useful for poor concentration, clouded mind, or mental fatigue. Most of this formula consists of Zizyphus (Suan Zao Ren), supported with herbs to cool deficiency heat, tonify Qi, and invigorate blood. Zizyphus is excellent for nourishing and supporting the heart in deficiency conditions and can be taken for long periods of time as a heart and shen tonic. Sedative, quenches thirst, nourishes heart blood, clears deficiency heat, protects the heart, invigorates blood, calms shen, etc. Neurasthenia, insomnia and neuralgic palpitation, thirst, restlessness, night sweats, anxiety, or vivid uncomfortable dreaming. Also useful for poor concentration, clouded mind, or mental fatigue. Take 10 pills, 3 times a day. Dosage can be increased up to 5 pills, if needed.